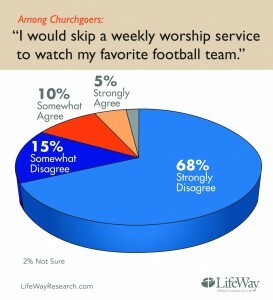 NASHVILLE (BP)—Most American churchgoers would rather attend church than watch their favorite football team, a LifeWay Research study shows. But a few die-hard fans are willing to miss out on worship to watch a game. About 1 in 7 churchgoers (15 percent) say they’d skip church to watch their favorite football team, according to a survey of 994 churchgoers. “Most churchgoers put divine revelation ahead of division rivalries,” Scott McConnell, vice-president of Nashville-based LifeWay Research, said. Some churchgoers, though, are more devoted to their team. Especially when the team is doing well. Two years ago, Daniel Espy, pastor of The Bridge Church in Snohomish, Wash., hosted a special 8 a.m. service to accommodate Seahawks fans, whose team had found success after years of struggling. The early service started as a joke on the church’s Facebook page. Espy joked that all churches in Seattle should hold early services, so fans could worship and then watch a playoff game. The idea took off and eventually landed the church on the front page of the local newspaper. These days The Bridge has two services, making it easier for church members to worship before games. Still, attendance goes down when the Seahawks have an early game. Espy says he’s taken a good-natured approach to those who skip church to watch football. He notes that works better than a guilt trip. “Honestly, we just try to show people that Jesus is better than football,” he said. Methodology: The phone survey of 2,000 Americans was conducted Sept. 19-Oct. 5, 2014. The calling list utilized random digit dialing. Sixty percent of completes were among landlines and 40 percent among cell phones. Maximum quotas and slight weights were used for gender, region, age, ethnicity and education to more accurately reflect the population. Responders were screened to only include those whose religious preference is Catholic, Protestant, Orthodox, or Non-denominational Christian who attend a religious service on religious holidays or more often. The completed sample is 994 surveys. The sample provides 95 percent confidence that the sampling error does not exceed plus or minus 3.5 percent. 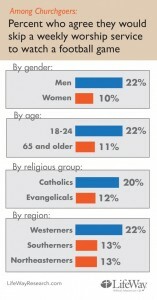 Margins of error are higher in sub-groups. View more articles by Bob Smietana.